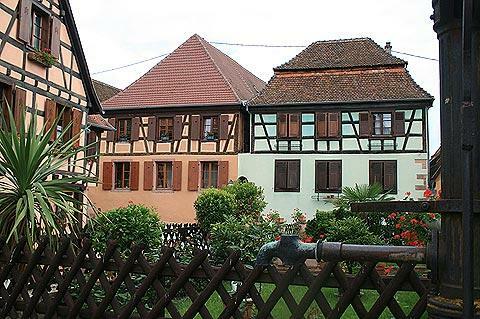 Hunawihr is in the Haut-Rhin department of the Alsace region not far from Ribeauvillé. 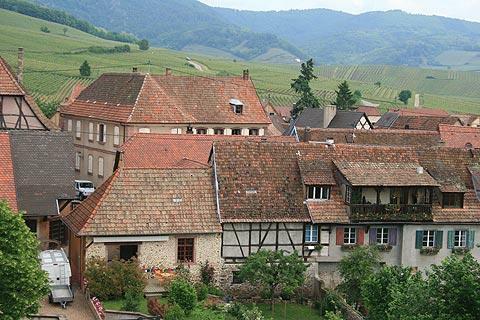 It is a small and very pretty village surrounded by the Alsace vineyards. 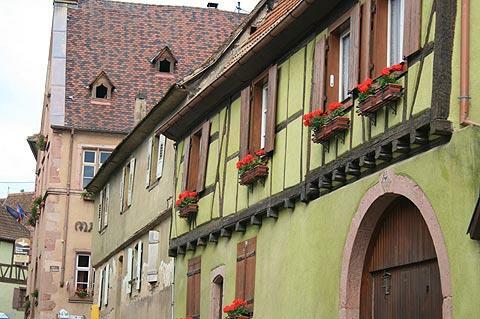 There are many beautiful villages in this region of Alsace but the brightly painted medieval houses, the church and the closeness of the vineyards make Hunawihr one of our personal favourites (and it is listed among the most beautiful villages in France). Start your visit with a stroll down the main street in Hunawihr. The street is lined with colourful half-timber houses, lots of wine houses offering tastings and an interesting selection of old water pumps. Note particulary the 16th century town hall in Renaissance style and the 17th century town fountain and source (water supply). Within the village there are numerous pretty houses and small gardens, most built around the 16th and 17th century. There are also a good number of more imposing townhouses built in the 19th century with the wealth generated from wine. Although facilities here are quite limited (Hunawihr only has about 500 inhabitants) there is a small selection of restaurants to choose from. From here you can walk up to the 14th century walled church on the edge of the village and this is where you really see why Hunawihr is classified as one of the most beautiful villages in France. 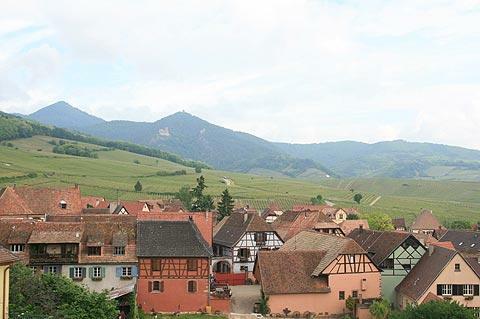 From the church you get great views down onto the village and across the wooded hills of the Vosges, dotted with various castles and absolutely all around vineyard after vineyard - fabulous! 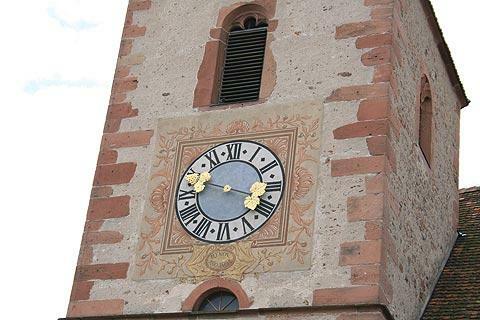 Take a look at the church clock, even this is a tribute to the importance of the vineyard and the clock hands are decorated with vine leaves. The church itself, the Church of St-Jacques-le-Majeur, is surrounded by a cemetery enclosed by a fortified wall and holes through which guns can be fired. It is hard now to imagine that the villagers in this peaceful place once had to take refuge here from their attackers! The fountain down the hill from the church, called the Fountain of Saint-Hune, is interesting because it is said to be where Hune, who founded the village with her husband Hunon, once washed the clothes of the poor. 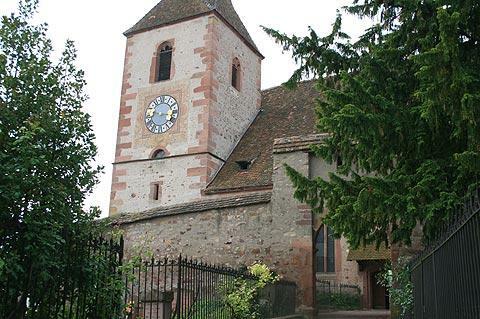 Canonised in the 16th century, the village is also named after Saint-Hune. Close to Hunawihr you can visit the centre for the reintroduction of the stork in Alsace - an important attempt to slow the decline in the 'trademark' bird of the region. Otters are also raised at the centre, and the 12 acre countryside park can be explored on foot following a guided route. Next to the stork centre there is a botanical centre in which hundreds of butterflies, including many exotic species, can be seen in their natural environment. 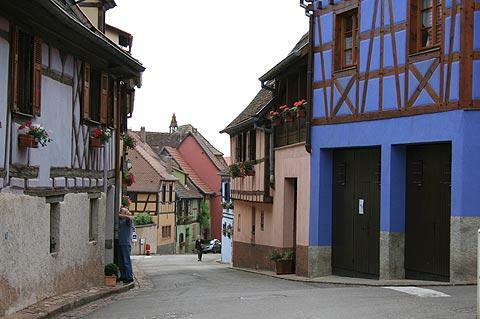 Most visits to Hunawihr will include trips to several of the other picturesque Alsace villages in the region and along the popular Alsace Wine Route. 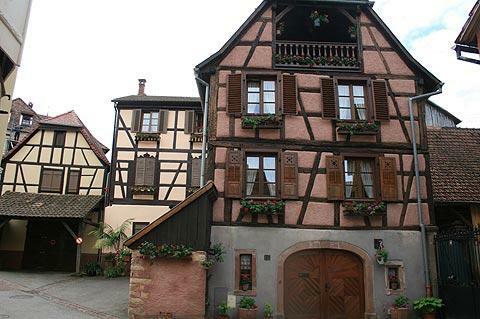 Somewhere you might not have considered visiting is the regional centre at Colmar which also has a great deal to see, with historic monuments in the old town and several interesting museums.